The Beautitudes : Day 4 By She Reads Truth. These days my daughters have been struck with a heavy dose of the equine magic, something unknowingly passed down from their mama, I suppose. As a child, I whiled away many an afternoon hour at the dining room table, painstakingly working to capture the essence of a mare and her young colt. Occasionally, they’d take flight as a pegasus or grow into a purple-horned unicorn. But more often than not, I fashioned my horses a traditional brown or black—-always majestic, racing through a large Crayola®-green pasture, willd, free, and unbridled. Fueling my wonder was a racehorse farm, just down the road from my childhood home. On slow summer mornings, my mother would walk with me, hand-in-hand, to admire the horses. Together, we’d watch them from the outside of endless white fences, their tails flick-flick-flicking away flies in the heat. On rare occasions, she’d lead me to the stables for a closer look, to stroke their muzzles, my fingers tentatively dancing across a velvety smooth coat. I’d stare deeply into the eyes of those beautiful beasts, in awe of their quiet, controlled demeanor—steely strength enveloped in a gentle disposition. Though humble in temperament and committed to the service of their master, you’d never doubt the power of these statuesque creatures. You would never think them weak. These animals are bred, born, and groomed for a few minutes of all-out greatness, and yet the day-to-day submission of their own will to that of their master’s is somehow equally awe-inspiring. The master has proven to be good and worthy of their trust. And so they wait on him. This is a picture of meekness: strength and power under control, submitted to the authority of the Father. He created us to bear His image and to bring Him glory (Genesis 1:27; Isaiah 43:7). And while we can honor God in deed and action—in how we run the race—we also glorify Him in our waiting and trusting in Him. 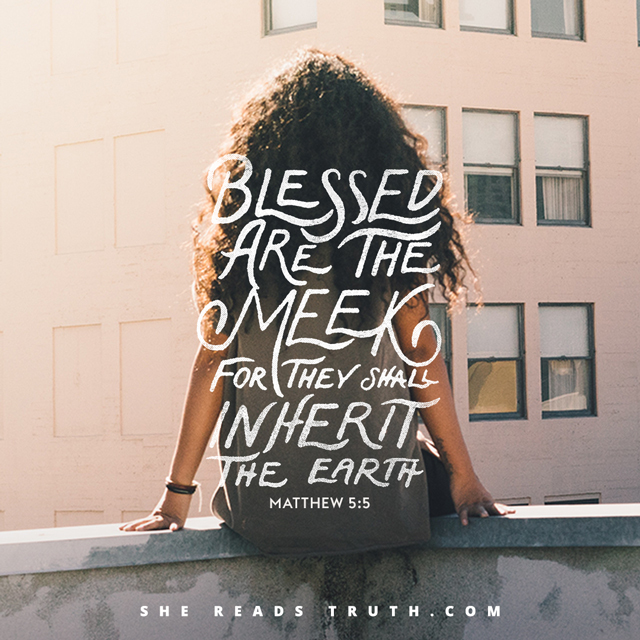 We glorify Him in our meekness, too. Scripture tells us Moses was the meekest man on the face of the earth, but he was far from weak (Numbers 12:3). The man who confronted Pharaoh, led the Israelites’ exodus out of Egypt, and parted the Red Sea, was empowered by God Almighty to lead and perform miracles in His name, yet he remained humble in spirit. He was just a foretaste of Jesus Christ, our Savior to come (Matthew 11:29). Jesus had all the authority of heaven and earth given to Him, yet He submitted His will to the Father (Matthew 28:18). The same God who met face to face with Moses endured the cross for the joy set before Him (Hebrews 12:2). He did it for us—we are His joy, His prize. This is the God who fights for us; we need only to be still and wait for Him (Exodus 14:14). We live in a world that distracts us from our true inheritance. At every turn, we’re told to make our desires happen now and on our own terms. But that’s orphan living, and we are daughters of the King. All that He has is already ours in Christ Jesus (2 Peter 1:3). Our inheritance is already secure. The post Blessed Are the Meek appeared first on She Reads Truth.